Dinesh Agarwal, founder of Indiamart.com, has been investing in start-ups since 1999, having done so in about 35 firms. He recalls only a couple of instances in the 2000s when start-ups were bought out and investors got an exit – eBay.in buying Bazee.com and Monster buying JobsAhead.com. Now, thanks to a spurt in mergers and acquisitions (M&A) among start-ups in recent months, venture capital (VC) and angel investors have been able to make exits on their investments, which are otherwise difficult to come by. So, Olacabs bought TaxiForSure, MakeMyTrip took over MyGola, Snapdeal bought Freecharge, Facebook took over Little Eye Labs and Twitter acquired ZipDial. ”This is very good for VCs and entrepreneurs. The entrepreneur might not be the right person to scale up a business. To create, scale-up and handle mature businesses, you need different DNAs, M&As enables that,” says Agarwal, who invested in Little Eye Labs. Global Super Angels Forum, Ventureast Tenet Fund II, 500 Startups, and KAE Capital Fund were the major investors in Little Eye Labs. “Earlier, investors would be able to exit when a company scales up and goes for an IPO (initial public offering) or raises a follow-on funding,” he says. A funding crunch at the Series-A stage a few years ago made follow-on funding and exits difficult for start-ups and investors. Investors say the current momentum in M&As show India is coming of age, as there’s a lot of money in the system. “Many companies have been funded in the same genre/sector. Not every one of them is going to succeed. Successful companies might want to buy and consolidate. It may not provide an optimal exit for an investor,” says Prashant Mehta, partner at VC firm Lightbox. Many of these M&As have been driven by investors common to both companies – Flipkart buying Myntra (Accel Partners), MakeMyTrip buying MyGola (Helion Ventures) – but is not necessarily always a bailout. “The smaller company could have created a niche, could have good technology but for 10 reasons, could not scale. For some, it is a faster way to acquire technology and market,” says Mehta. Embibe, an education start-up funded by Lightbox, bought a small firm, 100Marks, which has complementary content. A disturbing part of the M&As is that it is like a race, driven by capital. ”The whole mentality is gain market share, customers; I’ve got capital,” says an investor. In the US, the big buyers are large players such as Intel, IBM, CISCO, Google, Yahoo and now Facebook, Twitter. “The large companies in India haven’t yet bought anything of significance. 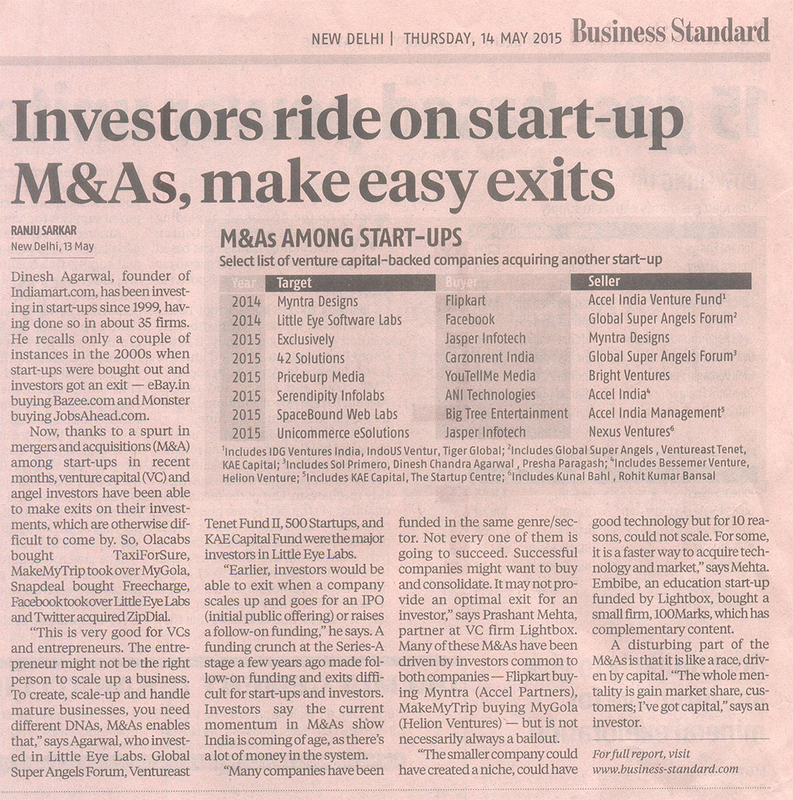 Till that happens, the M&A activity will not be comparable to western countries,” says Anand Lunia, founder at seed stage VC firm India Quotient. “We are not seeing a lot of foreign companies buying Indian startups to expand to India. Facebook, Twitter and Yahoo have made token buys mainly for technology. These deals have not been major events for investors,” says Lunia. It’s a matter of time, say other investors, that you will see more of these deals. ← Celebrating Mother’s Day at IndiaMART!